Yes and again I say Yes... America is within Bible Prophecy! It never ceases to amaze me of the stubborn ignorance of many Pastors, Teachers and Evangelists who claim that America is NOT in Bible Prophecy. These deluded teachers (mostly sincere, but sincerely wrong) claim that MANY NATIONS currently and in times past, have USED the EAGLE as their symbol, which is very true! They further presume that Daniel 7:4 could be talking about past or present nations, whose governments have used the EAGLE as their national symbol. However, there is NO current or past nation that has USED or USES the EAGLE as their symbol, whereby such EAGLE was PLUCKED-OFF of a LION. There is NO NATION of people, whose SYMBOL USED TO BE a LION with EAGLE'S WINGS, who REVOLTED and SEPARATED from both their COUNTRY and national SYMBOL, who thus ADOPTED the EAGLE as their SYMBOL. There is only ONE NATION in all of history to date, whose symbol is an EAGLE that was PLUCKED-OFF of a LION and that ONE NATION is America! Are you listening yet? America was a part of the BRITISH EMPIRE whose SYMBOL was a LION with EAGLE'S WINGS, before 1776 and AFTER 1776, the SYMBOL for GREAT BRITAIN became just a LION, whose WINGS are now missing. America, once belonged to a NATION, whose SYMBOL was a LION with EAGLES WINGS, but a REVOLUTION ensued, followed by a DECLARATION OF SEPARATION (plucked), whereby INDEPENDENCE was duly adopted. All of our Founders believed that America was surely birthed by Divine Providence and even acknowledged such providence within our Declaration of Independence, which says; "We, therefore, the Representatives of the united States of America, in General Congress, Assembled, appealing to the Supreme Judge of the world for the rectitude of our intentions... And for the support of this Declaration, with a firm reliance on the protection of Divine Providence, we mutually pledge to each other our Lives, our Fortunes and our sacred Honor"... 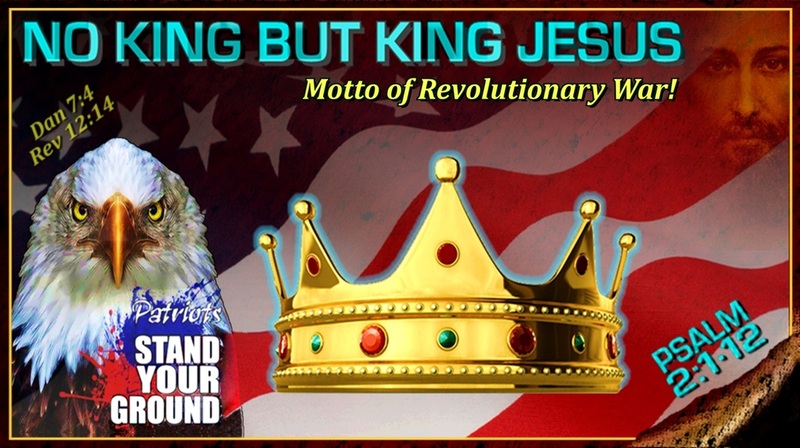 It is abundantly clear that our Founders believed KING JESUS was behind their good success. For even the official motto of the American Revolutionary War, proudly and loudly declared; "NO KING BUT KING JESUS"
Hence, since our Founders believed that America was wrought by the Hand of God and therefore knowing first-hand, of all the miracles recorded in newspapers, diaries and memos and considering that Americans were out-numbered, under-funded, lacked Military resources and expertise, yet defeated thee most powerful Nation of their time, surely points to the invisible Hand of the Almighty. Should there not be a mention of this GREAT EAGLE in prophecy? Should there not be mention of this GREAT LAST-DAY ALLY of Israel? YES and period, end of story! To resist these above truths, facts or to argue otherwise, is an utter denial of known historical facts and a rejection of Bible Prophecy, a dangerous place to be! 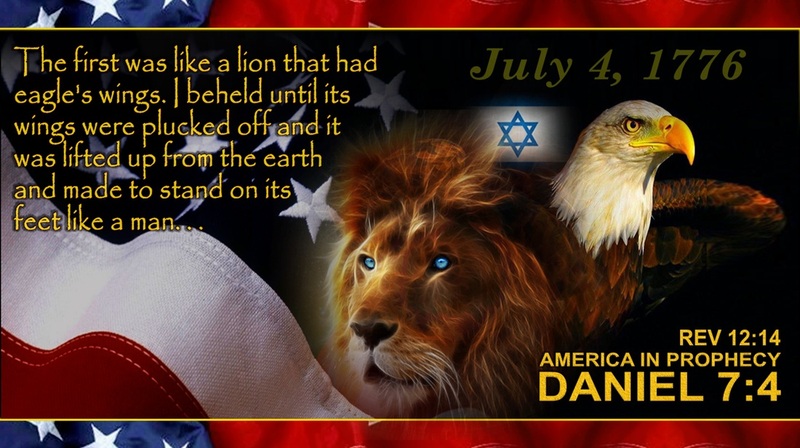 To further prove that Daniel 7:4 must be talking about AMERICA, it just so happens, that this prophecy of last-day nations that will be on the earth, at the time Jesus returns, is found in Daniel chapter 7 and in verse 4 (as in 7:4 ~ July 4th), which happens to be the BIRTH DATE of this EAGLE that was PLUCKED-OFF of a LION. Further notice, that in this vision, given to Daniel, this BEAST among ALL the other Beasts, the EAGLE WAS LIFTED UP ABOVE THE EARTH, describing its POSITION OF EMINENCE and POWER among ALL OTHER NATIONS of the earth. Since America was birthed, has not this EAGLE been LIFTED UP ABOVE ALL NATIONS OF THE EARTH in every way imaginable? Do not the huddled masses and oppressed flee their nations to escape to America, Home of the Brave, Land of the Free? All a coincidence you say? Are not these descriptions eerily reminiscent of America? Could Daniel 7:4 be describing any other last-day nation? You need to pray now to God and ask HIM if such is a coincidence and ask Him to reveal to you, if this interpretation is true, correct and sound. 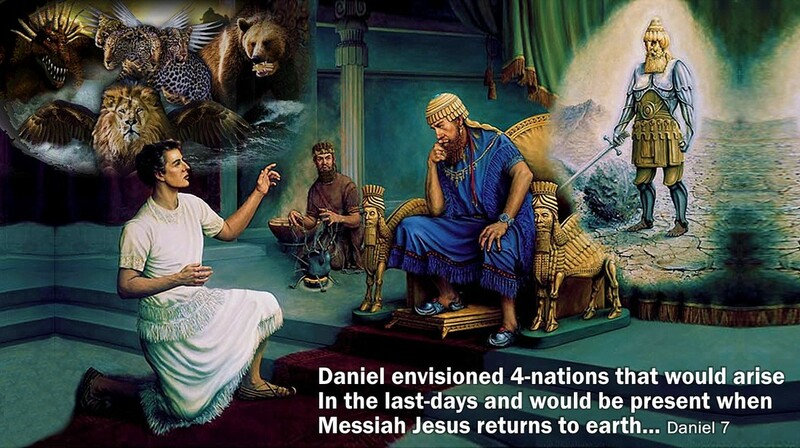 Keep in mind below, that Daniel's vision of Latter-Days, were visions regarding GOVERNMENTS, POWERS and LAWS. Hence the descriptions of this EAGLE in Daniel 7:4, being thus related, must be interpreted and MATCHED, not only with other scriptures, but also with the descriptions prophetically given of such future Governments, Powers and Laws in mind. 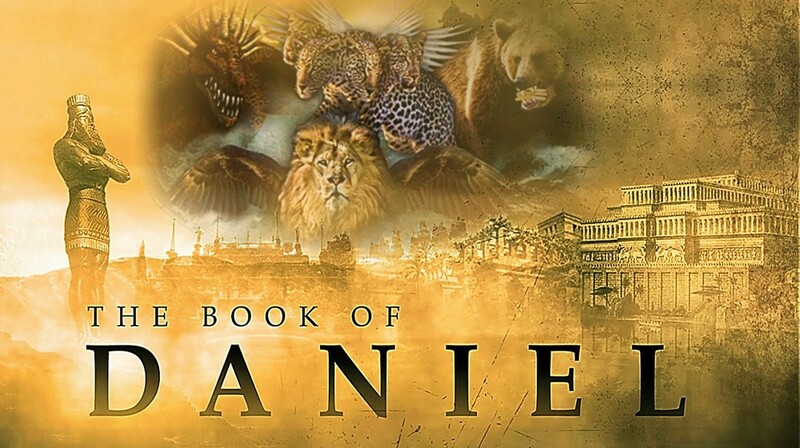 Hence, with that in mind, NOTE, that the 4-LATTER-DAY POWERS listed in Daniel, the FIRST LISTED is this LION with Eagle's wings, which were plucked-off of the Lion, was LIFTED-UP FROM THE EARTH, meaning; the LION with EAGLE WINGS were MENTIONED FIRST, having preeminence over the OTHER 3-POWERS mentioned. Great Britain was the world power BEFORE AMERICA was birthed and Britain's symbol was the LION WITH EAGLES WINGS. Secondly, the EAGLE WINGS were PLUCKED from this LION and the WINGS were LIFTED ABOVE the earth, meaning, the EAGLE'S WINGS were made to become thee GREATEST POWER and GOVERNMENT of LAWS among all the nations of the earth, even becoming SUPERIOR over the LION. 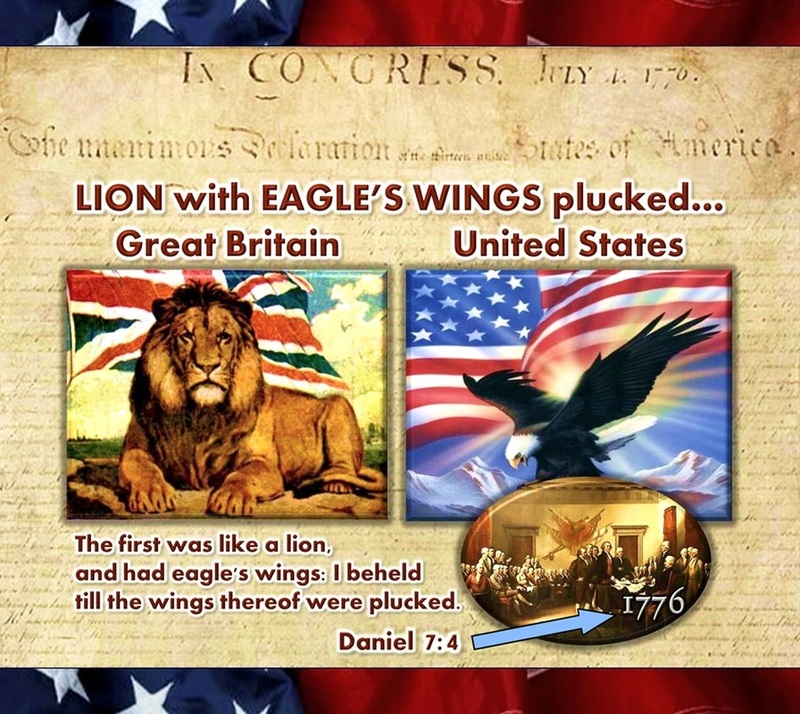 Was not America (eagle's wings) PLUCKED away from GREAT BRITAIN (Lion with Eagles Wings), then later became GREATER than Great Britain, in every way? To this day? Does not scripture reveal God promising Israel to make them the HEAD of the NATIONS and ABOVE ALL if they obeyed Him? And did not God also say unto Israel, that if they DID NOT OBEY, He would make them the TAIL or BENEATH all other nations? Due 28:13 & 37 ~ "And Jehovah shall make you the head, and not the tail. And you shall be always above, and you shall not be beneath, if you listen to the commandments of Jehovah your God, which I command you today, to observe and to do them... But if you do not obey and turn to the Right or the Left, you shall become an astonishment, a proverb, and a by-word among all nations where Jehovah shall lead you." Does not scripture also reveal that Lifts-up and puts-down whomever he wills? Psa 75:6-7 ~ "For lifting up comes neither from the east, nor from the west, nor from the south. But God is the judge; He puts down one and sets up another." So I ask you now, Of ALL the current and past nations that used the EAGLE as their symbol, which EAGLE has been deemed as the GREAT EAGLE? Clearly the answer is: AMERICA! Further notice, that these WINGS of an EAGLE were MADE TO STAND UPON THE FEET AS A MAN. Notice in this vision, the EAGLE'S WINGS were GIVEN FEET to STAND. First notice the SINGULAR (not plural) use of the word, "AS A MAN"... such a MAN is an INDIVIDUAL and America was primarily based upon many BIBLICAL PRECEPTS, one of which, is of INDIVIDUAL GOD-GIVEN RIGHTS to Life, Liberty and the pursuit of happiness, wherein ALL INDIVIDUAL CITIZENS possess under our Supreme Law, as outlined in our Declaration and Constitution. We all know that when an INDIVIDUAL MAN is STANDING on his FEET, he is able and ready to defend himself, family, friends and nation, especially when the LAW and GOVERNMENT is on his side, which God intended for the role of MAN and GOVERNMENT, to be and to do accordingly, treating ALL INDIVIDUAL MEN as CREATED EQUALS, just as our Declaration of Independence says... "We hold these truths to be self-evident, that all men are created equal, that they are endowed by their Creator with certain unalienable Rights"
Also note, that when ANY MORTAL MAN can STAND in the presence of God, such STANDING is a SIGN of FAVOR, FORGIVENESS and MERCY from the Almighty, which was granted to the immortal that could NOT STAND in or under GOD'S POWERFUL PRESENCE, because of his fallen sinful nature, but was MADE ABLE to STAND by the DIVINE GRACE of God. There are 2-Examples of such immortal sinful men, caught up before the Throne of God, who immediately fell as DEAD MEN or in a DEEP SLEEP, once they were in God's presence, but then were made ABLE to STAND before their Creator, after being touched/spoken to, by the Almighty! Then there is a 3rd-example, wherein we see the GOD-MAN Christ Jesus STANDING at the RIGHT-HAND of God before the Throne as a PROSECUTOR before a JUDGE, acting as an ADVOCATE for us, objecting to the murder of His martyr, the Apostle Stephen. In addition to this INDIVIDUAL MAN, described in our DECLARATION, who is strong, because of the Grace and favor of God, he can STAND firm on his FEET, because he also has the support of the SUPREME LAW and government of, for and by the people, on his side. We then see that this INDIVIDUAL MAN was given, A MAN'S HEART. But what man's heart was given to this EAGLE that was MADE TO STAND upon the FEET of a MAN? This can only mean, that the HEART, SPIRIT, WILL and MIND-SET of SOME OTHER MYSTERIOUS MAN was given to this EAGLE which not only represents a Latter-Day GOVERNMENTAL POWER, which was based upon BIBLICAL GOD ORDAINED INDIVIDUAL RIGHTS of INDIVIDUAL MEN, but was also given a man's heart, which evidently inspired, directed, guided, moved and blessed these individuals, which became the HEART and SOUL of this great nation. 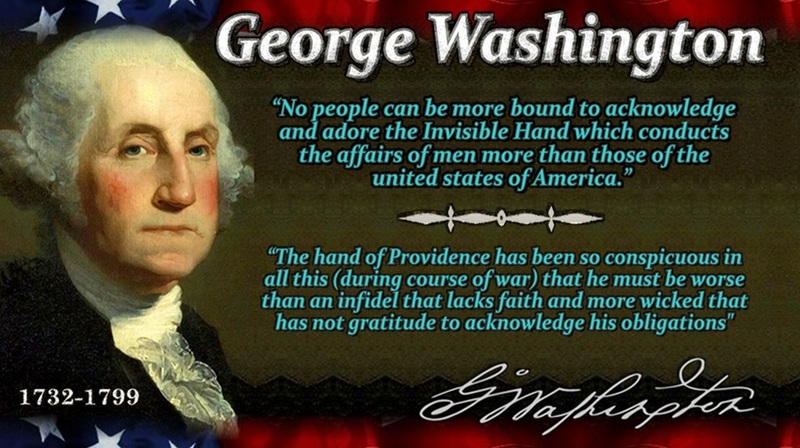 But what one man, could be the one, who has so influenced America's founders to become FREE and INDEPENDENT states, separating from the LION of Great Britain, thus birthing a never done before, Judaeo-Christian Constitutional Republic? The Founders will emphatically, boldly and loudly tell you, that that one man, is none other than; KING JESUS. America was founded upon biblical principals and the religion of Jesus Christ, who was GOD, who became man, to die for the sins of the world. This is the HEART and SOUL of our nation. 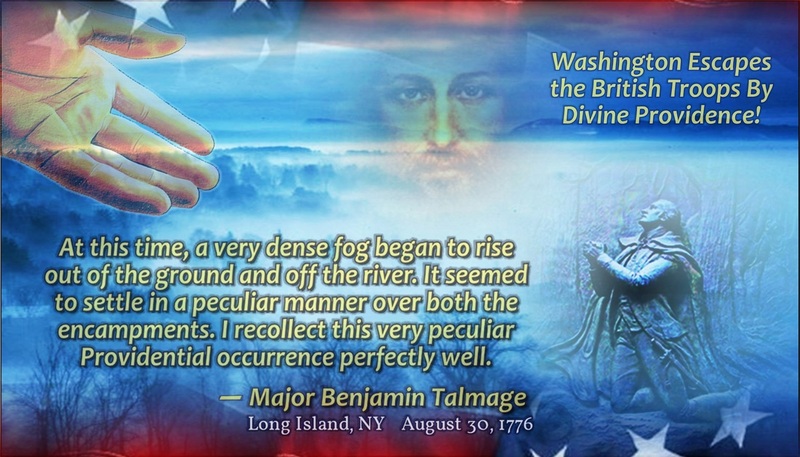 We are and were birthed on July 4th (7-4), as a Christian nation and the very HEART and SOUL of this God/Man Jesus, was given to America, the EAGLE. 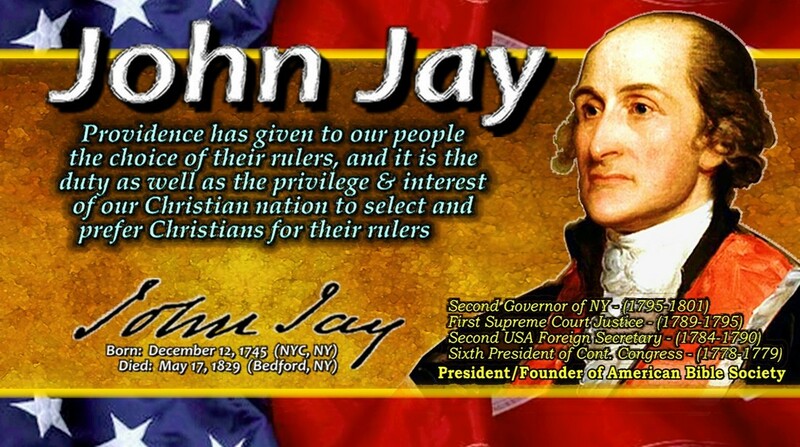 Our whole government was founded upon the Judaeo-Christian precepts, as found in Holy Scripture! Hence, America is thee only LATTER-DAY nation, in all of world's History, whose SYMBOL was an EAGLE, whose WINGS were PLUCKED from a LION, that was LIFTED ABOVE all the nations of the earth, who could STAND with GOD'S FAVOR because THEY HONORED GOD'S LAWS, because the HEART of their nation, was founded on thee GOD-MAN Christ Jesus, who directed, formed, guided and inspired godly men for such a time as this, so as to accomplish His will in the earth and for this EAGLE to be an ALLY unto ISRAEL during the tribulation. Finally, in the LATTER-DAYS we also see this LAST-DAY EAGLE of Daniel's vision, in the last book of the Bible. We read in Revelation 12:14, that a GREAT EAGLE with 2-WINGS (left/right) is given to ISRAEL as a HELPER who will HIDE and DEFEND ISRAEL during the Great Tribulation period. Despite that OTHER NATIONS may now or later use the EAGLE as their NATIONAL, MILITARY, ECONOMIC or WHATEVER SYMBOL, this GREAT EAGLE is called a GREAT EAGLE, because of ALL the other known EAGLE SYMBOLS of other nations on earth, there is ONLY ONE NATION whose SYMBOL is the EAGLE, that is GREATER THAN all the other eagles combined... and that Eagle is none other than America! So I ask you again, In these latter-days, of ALL the current and past nations that used the EAGLE as their symbol, which EAGLE is now & has been deemed as the GREAT EAGLE? Hence, this GREAT EAGLE in REV 12:4, must be none other than AMERICA who comes to the AID of ISRAEL... Further, is not AMERICA, whose SYMBOL is that of a GREAT EAGLE, one of the ONLY ALLIES of ISRAEL (woman clothed with 12-stars) in these latter-days? What other ALLY, whose SYMBOL is of a GREAT EAGLE, does ISRAEL have on their side? Is not and has not AMERICA been thee GREATEST NATION on the face of the earth since 1776? Has not AMERICA been thee MOST POWERFUL and MOST PROSPEROUS nation on the face of the earth since 1776? Do not other nations call AMERICA the GREAT EAGLE?... and who, continually flee oppressive regimes world-wide, who flock to America's inviting and humble shores? Further notice, that this Great Eagle has 2-WINGS... Is not America's political system made up of 2-Wings? 2-Parties? Left and Right? One of several factors that makes America Great and unique, is its BIBLICAL GOD-GIVEN RIGHT of RELIGIOUS FREE SPEECH and POLITICAL free-speech and the RIGHT of the people to PETITION their government for a redress of grievances and the RIGHT to PEACEABLY PROTEST to seek remedy & recourse against that which is wrong and keeping that which is Right, right. Most other nations stifle such biblical free-speech & greatly suffer as a result. These 2-Wings cause this GREAT EAGLE to soar HIGH ABOVE the nations! Can you imagine an Eagle soaring to greatness with one wing? America may not be GREATLY or LARGELY described in Bible Prophecy at length, but AMERICA is found in Bible Prophecy and will be here during the Great Tribulation, to assist Israel and America will be here when the Lord returns! It's high time that Pastors, Teachers, Evangelists, other Leaders within the Body and for all such followers of the Lord, to buy a vowel and get a clue from King Jesus, through the reading of His Word and by Revelation of His Spirit, regarding these latter-day prophetic utterances and role of America in Bible Prophecy!